This year’s February Livery lunch was held on Wednesday, 7 February at the beautiful Apothecaries’ Hall. It followed a morning Court meeting which concluded with The Master appointing Garvin Brown IV, Nick Carr and Mr Jean Deillon as Stewards, and Bob Russell, Paul Finch and Geoffrey Bush as Honorary Stewards. The Master then presented the Livery to Charlie Beamish, Simon Hales, Angus Gordon-Lennox, Stephen Gould, Amanda Ludlow, Chris Maybin and Sukinder Singh. William Grant and Sons was also welcomed as a Corporate Freeman of the Company, represented by John Broadbridge. In proposing a toast to the guests, Mr Trevor Stirling introduced three visiting Masters, Alderman Peter Estlin (International Bankers’ Company), Mr John Poulton (Glass Sellers Company) and Mr David Philip (Scriveners’ Company); and The Master’s personal guests, Mr Charlie McAndrew (Past Master of the Grocers), Mr Stevyn Gibson (Past Master of the Cooks) and Mr Sammy Dow. He also welcomed the guest speaker, Mr Nicholas Charrington DL, a Past Master of the Broderers and former High Sheriff of Essex, often seen driving around in his own red double decker London bus. Mr Charrington’s response on behalf of the guests, and the closing speech made by The Master, Mr Bryan Burrough, were both extremely informative and entertaining, and touched on the theme of family and industry heritage, bearing in mind both the venue and The Master’s guests and his own forbears. The Master first owned up to the fact that one of his great grandparents was Jessie Boot an apothecary, but his father’s family were gin distillers, hence The Master’s deep appreciation of the relative efficacy and benefits of products resulting from both sides of the divide. He then outlined the intertwined history of the Distillers, Apothecaries and Grocers Companies. The Company of Grocers was first established in 1345, the second in order of precedence among all the 110 Livery Companies of the City of London. The Apothecaries were originally part of the Grocers, but in 1617 they negotiated an amicable demerger and became independently incorporated as a City Livery in recognition of their special skills in compounding and dispensing medicines. 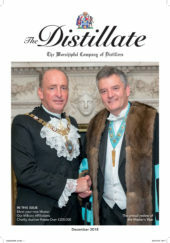 In 1638, The Distillers & Vinegar Makers themselves managed to separate from the Apothecaries and were incorporated as The Worshipful Company of Distillers. Following the Civil War (between King and Parliament, not Apothecaries and Distillers!) a subsequent Charter was granted by Charles II confirming all the Company’s rights. The Master concluded the lunch by presenting the Livery golf prizes and the following Distillers’ Scholarships have been awarded: the WSET Professional Certificate in Spirits to Ms Fiona MacDonald; the WSET Diploma to Ms Marina Kamburova; the IBD’s Diploma to Mr D Withers; the IBD’s Module 2 to Dr J Turkington; and the IBD’s Fundamentals of Distilling to Mr B Forbes. Following generous quantities of Osborne 1995 Port, the guests retired for a restorative stirrup cup with the Master, where they were joined by the consorts of Liverymen who had dined with the Mistress at a separate lunch at Tallow Chandlers’ Hall.